My aunts and grand mothers, as well as their friends and their neighbours always kept within reach a supply of home-baked sfoof , in an old biscuit tin. 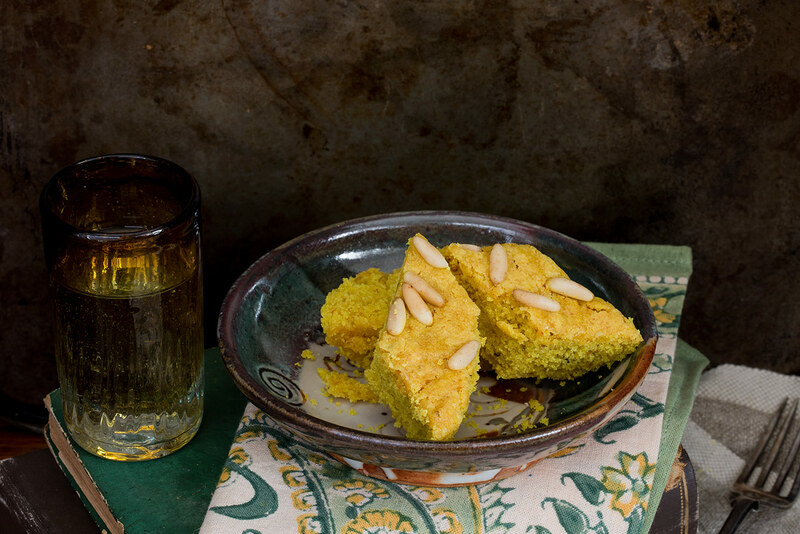 The battered container with a faded picture of an idyllic landscape made its appearance at 11 am when the yellow cake accompanied a cup of thick Lebanese coffee. It was brought out again in the afternoon to treat visitors or to give as snack to the young ones. Sometimes they sprinkled it with sesame seeds instead of pine nuts, and sometimes they used ground aniseed rather than whole seeds; whichever was their way, sfoof was cooked by many and loved by all. Sfoof will keep for a week to 10 days in an airtight container. Mix the flour, turmeric and baking powder in a large bowl. Place the sugar in a pan and dissolve in water over low heat. Add the aniseed and the butter; stir to melt. As soon as it starts to boil, remove from the heat, leave to cool and allow the aniseed to infuse, for 5 minutes. Incorporate the olive oil into the aniseed syrup. Combine the liquid mixture into the flour. I find using a balloon whisk is the easiest way to avoid a lumpy batter. At first, the mixture will feel quite runny but will soon thicken. Butter a rectangular ovenproof dish measuring 33 cm x 23 cm x 5cm. Scatter pine nuts over the surface and bake in the centre of a hot oven for 35 to 40 minutes. Exact times vary from oven to oven. The cake is done when the surface feels pillowy and springy when you gently press a finger against it. Transfer the tin to a cooling rack. Wait a few hours, preferably overnight, to cut the cake into square or lozenge shapes. The cake will keep for one week in an airtight container.